Does your child’s playroom look like they’ve invaded FAO Schwarz? Are you struggling for space and tired of picking up toys? Wouldn’t it be nice to have some handy storage solutions, and to get some tips on how to organize toys? I can’t remember the number of times I’ve stepped on a piece of Lego on my kids’ bedroom floor. I’d have to bite my tongue so I didn’t scream and wake them. When they were younger, it wasn’t Lego but giant building blocks, but they were just as bad. I dare say next will come the superhero figures, or Barbie dolls and all their accessories. Let’s look at some storage ideas, so you — and your child — can organize toys and keep them tidy. A simple shelving unit can give you plenty of room to organize toys for your kids. You can set some out on display and store others in baskets, boxes or bags. This will also grow with them and eventually, you can replace the toys with books and stationery. I like the versatility this option offers, plus the fact that some things can be placed on high shelves out of reach. You might want to keep some toys on hand in the family room but not want them on show when your child has finished playing. A storage box is great for keeping toys out of view. I particularly like that this option doubles as a seat for extra room when you’re entertaining. Guidelines are included here (source). Simple plastic vegetable racks make a superb storage solution for organizing toys. They stack on top of each other and keep those blocks off your floor, and out from under your feet. Easy to access, this toy organizer is a budget-friendly option you can pick up in any hardware store. The plastic bins in this storage unit make it easy for you and your child to see what’s in them. No more digging to the bottom of the toy box to find what they want. Each bin can be assigned its own toys, removed for playtime, then replaced when it’s time for playtime to be over. Plastic containers, like Tupperware, are an excellent solution for storing small items on shelves. You could color code little one’s Lego pieces into boxes or keep all of a doll’s accessories together. As the children grow, they can then be used for arts and craft accessories for your budding artist. A simple “DIY” solution for under-bed storage is rolling carts. An open-topped wooden box with handle can be rolled out when it’s needed and safely stored away out of sight afterward. Just get some wood, wheels, and nails, and away you go. You can find step-by-step instructions here (source). You could even make dividers for your drawers. This video shows you an easy way to do it. Want to keep all your child’s electronics in one place? Maybe they have a lot of dolls that need a bed at night. A wash basket, with or without handles, can keep everything visible in one place. If you want to store smaller items which could fall through the slats, simply line the basket with some fabric. Hanging a shoe organizer on the back of a door makes great storage for any number of items without taking up space. It could be a multitude of teddies, cars, barbies, superhero figures or crayons and pencils. You can choose from clear plastic pockets where everything is easily identifiable, or cloth ones to hide them from view. All kids love a tent to play in. An indoor/outdoor solution for organizing toys might be a play tent. Garden toys can be stored in the tent when your children aren’t playing in it. Indoors, it can give your little ones a hiding place for them and their soft toys. Toy cars have a habit of hiding under furniture or being spread all over the home to trip you up when you least expect it. Create a space to organize all those cars, from a wooden crate and some plastic tubing — a solution your budding Nascar racer is sure to love. With or without decoration, a drawstring bag can be used to organize small toys. Whether for cars, trains, soft toys, wooden blocks or Lego, pop them in the bag and hang it from the door handle or on a hook. You could even get a bag to color coordinate with the room’s decor. Are you handy with a pair of knitting needles or a crochet hook? Put your talents to use and create a bag to organize toys for your little one. Make it nice and chunky using a large size needle and some thick, sturdy twine. A bonus is it could be washable if you use the right fabric. Do you have a hanging planter stored away in your garage that you don’t use? A lick of paint and some added decoration will make it the perfect place to organize soft toys. It will keep them off the bed and as you can see into it, it’s easy for your child to choose a sleeping buddy every night. Does your child have a lot of stuffed animals or dolls that they refuse to part with? Use some net hammocks to organize toys in the corner of their room. You could even string one across the bottom of their bed to give them instant access to their favorites. Are you wondering what to do with your diaper stacker now that you no longer need it for diapers? Why not use it to organize all the extra cuddly toys that are stacked three high on the end of your child’s bed? They’ll look quite cute sticking their heads out to see what’s going on. Plastic crates can be fixed sideways to any wall with a few screws, to make a versatile shelving storage system. You can add as many or as few crates as you need, and place them as high or low as you want. Use them for board games, books, soft toys, cars, and many other things. Freestanding individual baskets which can be stacked on top of each other are a quick and easy way to declutter a room and organize toys. Choose your colors and place them in the corner of a room. Get your child to help you sort the toys out so they know where to find them later. These are ideal for storing Lego, hair accessories, dolls’ clothes and accessories, or all the fiddly little bits that come with toys. It just takes a little stitching to pull this project together and ensure those small pieces never get under your feet again. You can find a step-by-step guide to making them here (source). This is a space-saving way to store Lego which doubles as a play mat. Your children can build away to their heart’s content and then, when they’re done, just pull the drawstring to store the bricks away. There’s some measuring and sewing involved, but you can find full instructions here (source). Little ones love playing with cars and storing them can be an issue, especially when your child wants them where they can see them. Magnetic knife strips attached to a wall make a great place to display metal cars. Even an older child might like these decorating their room. Does your yard look like a kindergarten crossed with a toy store? You go out to mow the lawn and spend hours picking up balls and toys first. Why not get some metal buckets and store them on shelves in the shed or garage? Not only will it organize toys, but it also keeps them protected from the elements. You can put lids on for further protection if preferred. Bath toys seem to take forever to dry out, especially rubber ducks, which always take in water. They’re great fun to play with, but you don’t want them in the tub when you’re going for a relaxing bath. 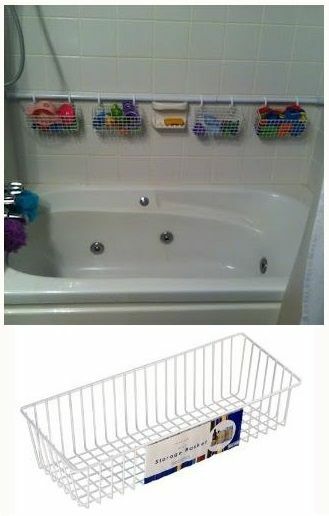 Use a tension shower rail, some hooks, and plastic, rust-free baskets, to organize toys in the bathroom. I love this simple idea for drying and storing bath toys. Use a mesh laundry bag with a zip stitched in and a plastic hanger. Put the toys in when bath time is over and hang it from a shower fitting. Just make sure you use thread that’s strong enough to take the weight of the wet toys. Does your child get to the end of a puzzle and there’s a piece missing? Are you forever looking for Barbie’s missing shoe or the spare rubber wheels for a toy car? Why not use pencil cases to keep all those things together? You can then organize these toys in a place where you can always find them. Board games can take up so much room. If you’re like me and at a loss as to where to put them, this is a good solution. It’s just a closet organizer, which you hang from a fixed pole. You could get more than one and organize other games and toys beside it. Knowing where to store and organize toys can be a headache. There are only so many drawers and cupboards you can use, and they inevitably end up dotted all around the home. Solutions which not only organize toys but also teach your child where to put them when they’re finished are a godsend. No more missing pieces and parts, and a bed that your child can get into at night without wrestling with the teddies. We hope you enjoyed our ideas on how to organize toys. We would love to hear your comments and any ideas you would like to share with us. If you know another mom who is struggling with toy space, please share.